I have lost my hair in great numbers. 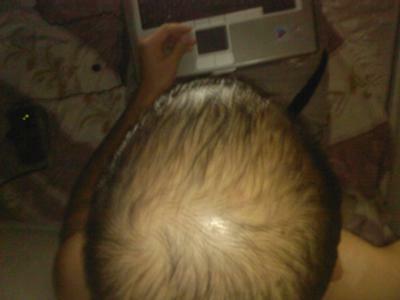 It’s like turning to a bald person even though my age is 29. I have tried many medications including minoxidil which am using now, but I don’t see any result. Also my hair is becoming thin and weak day by day. Please help me with this problem; I don’t understand how I can get rid of this problem. Helpful info. Fortunate for me I found your website by chance, and I'm shocked why this twist of fate did not took place earlier! I bookmarked it. Friend just rub small onion (cut it using knife) in your scalp before bed for about 3 months and see results. Its a possibility due to so many medication/ other products you have used in the past is causing the hair loss. All that medication probably haven't cleared your system yet and using minoxidil is gonna take time to see results anyways. Looking at the pic seems like you have a more serious problem like a terminal illness thats causing you to lose your hair like that. Many people using Minoxidil experience thinning hair and loss at start which is expected and called shedding phase. This side effect should be mentioned in instruction note(s) inside the box. First you should know that Minoxidil is not for everyone and although it can be bought without prescription in many countries, it should be only used in consultation with your Medical Doctor. Topical use of Minoxidil is used to stimulate hair growth on scalp and its not for every type of hair loss and you must go through blood examination for proper prescription. You might suffer from male hair loss caused by DHT, which should be treated by different type of medication(s) like Procerin. It also depends on when you started using Minoxidil? It may take several months (3-6 or even 9 months) before you notice any results. If you using Minoxidil 3% or 2%, then probably its not strong enough. Minoxidil 2% is mostly used for female pattern hair loss and male patients response less successfully to treatment. Consider the option of changing to 5% solution in consultation with your medical advisor. Here you can find more answers about Minoxidil and all its side effects.